The further you go back in your tree and the more branches you find, chances are you’ll find a French ancestor. Unfortunately with French research you need to know the exact place that person was born (Or get very lucky with a unique surname) to be sure you’re looking at the correct person. French records are indexed by town (Archives de la ville de ____) and/or Departement (Archives Departementales de ____) Plus modernised versions i.e. Rouen incorporated adjacent towns so some records are in the Archives Municipales (Old Rouen), some are in the Mairie de Sotteville or Grand Quevilly or Petit Quevilly, some are in the Seine Maritime Archives. The key is that there is no National Register like the UK BMD. Often finding the starting point is the hardest thing. In my research almost all records that I have linked to a French ancestor have simply listed a birth place as “France” which might as well say “Born on Earth”. If you’re reading this though, chances are you have a rough idea or exact location in France the person is from. Finding that missing record that gives an exact location is what will open the door to your French branches. One really useful website if you don’t know where exactly in France a person is from is GeoPatronyme. It plots where a certain surname is popular and when used on quite unique names, it can narrow down locations massively. 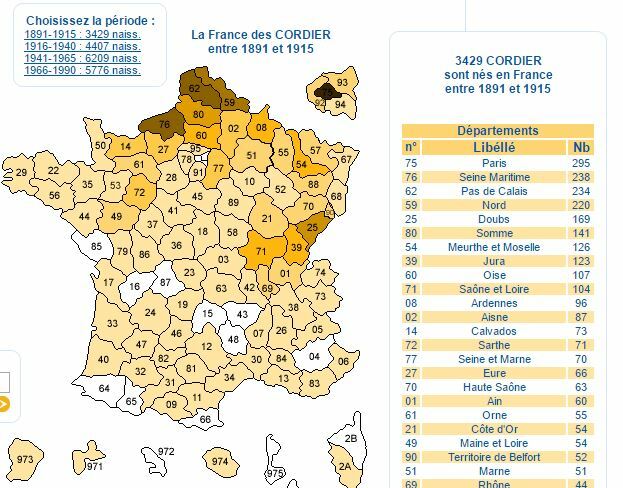 Using the French name I have been researching the picture below shows where the majority of people with the Cordier surname live. Genealogie.com is probably the most popular French Genealogy website currently and although it is a paid site it can be manipulated in such a way that allows you to get the basic information you’ll need to search the relevant archive for the actual records. An example I came across that will help demonstrate this was when researching “Pierre Louis Oscar Cordier”. All I knew about him came from English Records and luckily one census listed his birth place as Vendee, France. On Genealogie you can do a free search but can’t view records and they are vague about the year i.e they’ll show 1900-1925 for any year between them. In this case, I searched ‘nom’ as Cordier, ‘prénom’ as ‘Pierre Oscar’ and then on the results page, under ‘Initiale du prénom’ chose ‘O’ to pick up the ‘Oscar’. Straight away, at the top of the list is a Pierre Louis Oscar Cordier born sometime between 1850 and 1875 in La Roche-sur-Yon. Narrowing it down by going back and searching again using exact years each time i.e searching 1850, 1851, 1852 etc and putting in ‘Cordier’, shows this man was born 1842. You can then choose to either pay for the record and get it straight away with no fuss or head over to the Vendée archives and try to pick it up on their free Etat civil database. If you want to learn more about French records and plan to do a lot more French research it’s worth using this method as you’ll get used to using and reading French Records. Unfortunately most district archive sites don’t make it easy to directly link, but a quick check of the index for 1842 (at the back of the births section, not right at the back) shows me he’s there, number 192 (image 92 of 357). If the person you are looking for was in the French Military there are a few different avenues you can persue in order to find the sources you need. The French military records, held at the Service historique de la Défense in Vincennes, have in the past been difficult to access until recently with a change of leadership, things are getting slightly easier. This however will require a trip to the archives either by you or a local researcher. Another way is by looking at official documents, gallica.bnf has loads of searchable records that can be viewed for free, so is definitely worth a look. One way I’ve found particularly fruitful is using Google Books to search for French Military results. One good way to find sources relating to a member of the military is by searching for the surname followed by first names. For example searching for an ancestor called “Jean Baptiste Alexandre Cordier” in Google books should be done “Cordier Jean Baptiste Alexandre” as well as trying abbreviations of each, like bte or bapt in place of baptiste as well as using initials only. The Ste Helene Medal was given to soldiers that fought for Napoleon and we’re still alive in 1857. If the person you are researching falls in to this date range then this can be a very valuable resource. The Ste Helene website not only has documents and translations but also portraits of many of the higher ranking officers. The further you go back in your tree and the more branches you find, chances are you'll find a French ancestor. Delighted to find your site, have French Canadian ancestors, and would like to find their families back in France. I can read French. Things have changed since last fall. Genealogie.com became Filae.com (it is the same company). Filae.com indexed and published all the French civil state records for the entire 20th century (BMDs). The search engine results are directly related to the images that are stored on the Filae servers. To access the images you will have to take a monthly or yearly subscription at your choice. I encourage you to test it. It’s really worth, it can unlock a dead branch on your Family Tree or find someone that moved away from his relatives.